For centuries, people have bathed in the mineral-rich seas of the world to help promote good health and beautiful skin. Ancient records show that people traveled many miles to bathe in salt waters such as the Dead Sea, the Black Sea, the Red Sea, the Blue Lagoon and the famous mineral springs around the world. The mineral-rich, salty waters have been know to help alleviate even the most severe cases of dry skin disorders. Salt water bathing stimulates circulation, hydrates the skin, increases moisture retention, promotes cellular regeneration, detoxifies the skin, and helps heal dry, scaling, irritated skin. It also reduces inflammation of the muscles and joints, relaxes muscles and relieves pain and soreness. 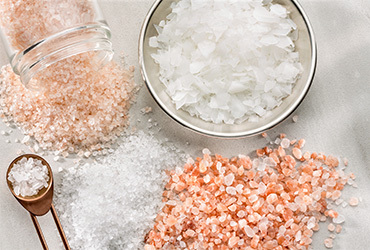 Important minerals such as magnesium, potassium, bromide, and calcium are readily absorbed into the skin during salt water bath soaks.